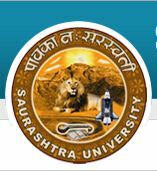 Saurashtra Uni BA Bcom Sem 6 Online Application – Friends, the Saurashtra University has started online application for B.A & B.com Semester 6 Examination 2015. Candidates can apply online from official website http://external.saurashtrauniversity.edu/admission/ or form below link. More update keep visit this website.